See in Glossary aspects of a multiplayer game. See in Glossary for the Network Manager in the Editor allows you to configure and control many things related to networking. 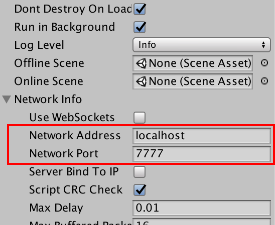 See in Glossary into these slots activates networked Scene management. When the network is stopped, by stopping the server or host or by a client disconnecting, the offline Scene is loaded. This allows the game to automatically return to a menu Scene when disconnected from a multiplayer game.